While the authenticity of this manual has been demonstrated on several occasions and in several publications, there are still critics who proclaim on various websites that it is a hoax, that logical arguments support that contention and that it is “widely assumed” that the manual is a fake. Their reasoning often lacks specifics, relying upon extrapolations of security processes backward in time to 1954 from their experiences decades later. This article highlights and summarizes the rebuttals to such proclamations. In addition, there are several NEW pieces of evidence, presented here for the first time, that strongly favor the authenticity of SOM1-01. Let’s begin with the new, less widely known evidence. First is the work done to identify and locate personnel with the initials EWL and JRT, as shown on the change control page. 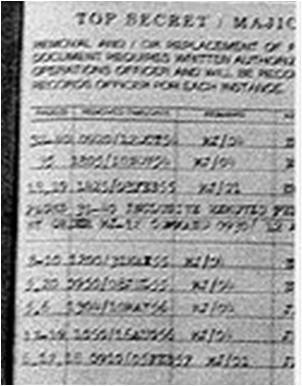 Page two of the Manual is a security control sheet, to be expected in a Top Secret document. It displays the authorization for any changes to the text made after initial publication, including the dates of those changes, the authority and the initials of the officers physically making the changes in the master pages. There were two individuals, one with the initials EWL and one with the initials JRT. Ryan Wood took the initiative to find the telephone book for Albuquerque, New Mexico; and sure enough, two military officers with the correct initials were living on base (Kirtland AFB) at that time. After examining all the phone book listings for people with last names beginning with L or T, the search yielded Col. Edward Levin (246 Perimeter Dr SE) for EWL and Lt. J. R. Totten (223 Perimeter Dr SE) for JRT. Jess R. Totten was an active 1st Lieutenant in 1954, according to the Air Force Register of January 1955. What are the odds of finding two officers with the right initials, in the right time period, living on the same street at Kirtland AFB? Ryan and Bob Wood are actively pursuing verification of the relatives of possible EWL’s and JRT’s, because although it is an amazing coincidence, it is not proof until we can get confirmation that we have the right officers and that they or their relatives concede they were there, and they were involved. Ryan actually interviewed Jess R. Totten and showed him the SOM1-01 and the page with the initials. Totten candidly said that it wouldn’t surprise him if we had a program like that, but that JRT wasn’t him. So, the search continues. The second new piece of evidence is the confirmation of the location on Kirtland AFB of the correct building. The back side of the cover page was stamped: “Unit KB-88, BLDG. 21. Kirtland AFB, N.MEX” as shown here. One of our investigators actually went to the base, confirmed with facilities personnel the building location for the era, and took a photograph of this building, thereby proving its reality. In addition, the abbreviation of New Mexico in 1954 was indeed N.MEX., according to the recommended U.S. Post Office instructions of that era. The use of two-letter state codes began in 1963 to make room for the use of ZIP codes. The third piece of evidence is establishment of provenance one step back to the location of the mailing of the canister of film to La Crosse, Wisconsin, including the handling of the original manual by another investigator (James T. Westwood). The roll of 35 mm film arrived in a canister inside a box from a pharmacy in LaCrosse, WI. This was determined by examining the Postage meter, 2223773, Postalia, La Crosse, WI, Mar 7, 1994, issued to Quillin’s Drugs, shown in the image below. Knowing that it was a drug store, we were able to determine that the proprietor was the Quillin brothers. One of our investigators actually went to LaCrosse and stated that, as a result of his persistence with the secretary Helen Stewart, he was able to hold a copy of the manual that was photographed in his hand. We have his word on this statement. The fourth piece of evidence is the discovery of a witness who handled the manual during an assignment to destroy documents while he was in the Navy. Yeoman Dale Bailey was ordered in 1976 to shred documents in the vault of Admiral Frederick H. Michaels over the weekend. When we showed Bailey a copy of the SOM1-01, he recognized it as one of the documents he had shredded, saying it was so interesting that he had read it. A detailed discussion of the investigation that led to the interview with Yeoman Bailey is awaiting publication. The skeptics initially (1996) came out with a number of criticisms of the manual’s authenticity, some of which merited careful review and some of which were easily answered. The new SOM1-01 website (www.specialoperationsmanual.com) contains rebuttals to 63 such concerns. A typical criticism might be paraphrased, “I was highly cleared and I never saw such a manual;” (rebuttal: was he cleared in 1954, and does he understand compartmentalization? 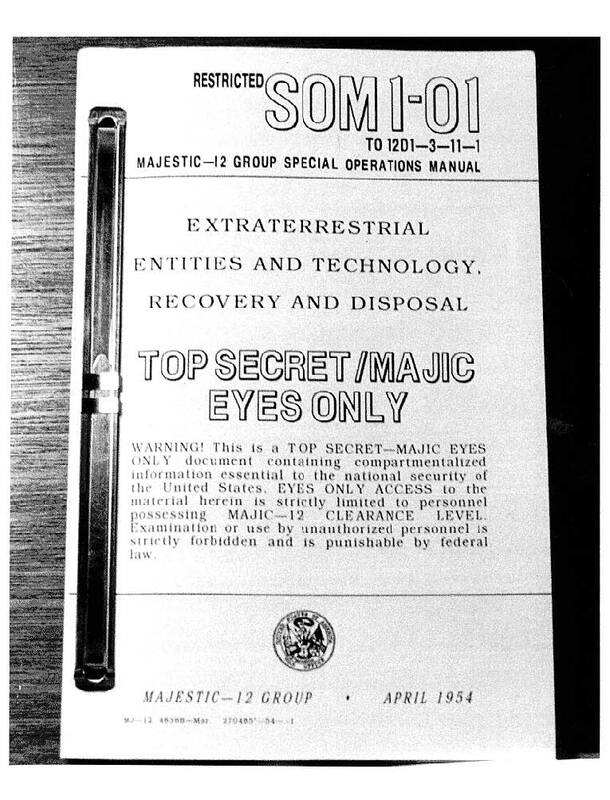 ); “the security procedures don’t conform to those required and in use at that time;” (security for UFO programs would likely not be consistent with more routine procedures, especially at the Top Secret level); “it might have been a ‘cut and paste’ job” (“might have” is not an evidentiary remark); “content of the manual is strikingly inappropriate for this stated purpose;” (read the stated purpose under “scope” on page 2); “does not meet the standard required of military manuals of this type” (it uses existing procedures well-documented elsewhere, and is probably oriented toward educating officers, not the enlisted or civilian personnel carrying out the retrieval operations). Each of these concerns and some others were treated in our initial rebuttal. A little later, after the skeptics had started to read the manual carefully, they made better points with the following questions: “Where is the document control?” (see discussion above on JRT and EWL); “Why do they talk about crashed satellites in a 1954 manual when satellites did not exist until 1957?” (we found copies of numerous public articles talking about satellites well before April 1954, and the last change page is actually 1957); “Did Area 51 and S-4 exist in 1954?” (newspaper articles say they existed as early as 1951); “Is not the Restricted marking on page one incompatible with Top Secret classification?” (there are other examples of this usage); “Isn’t it true that dish radars cannot measure size and shape? (not true, because with multiple hits you can tell a lot about size and shape, plus there are records of measurements with airborne radar); “Isn’t it easy to fake any type fonts today with modern technology?” (maybe today, but this was photographed in 1994, and the type fonts are consistent with those defined for use in the Government Printing Office Style Manual); “It’s psychological warfare to confuse the ufology community” (how silly, why attract the concerted attention of real foreign intelligence spies to penetrate super secret organizations, details discussed in paper6). We believe all these concerns about authenticity have been answered, thereby ending the discussion. Nevertheless, some skeptics still say, “It might have been fake,” without seriously dealing with the points made in the two preceding paragraphs. It was unquestionably printed in 1957 using a hot lead printing process. The control number shown on the title page at the bottom is exactly the right format and style. Everything about the manual is consistent with publication procedures in use by the Government Printing Office at that time. The type font is Monotype Modern. However, the “zinger” for 1954 is the fact that the manual has several “z” letters that are raised above the rest of the type. See the nearby inset as an example. This occurred because some lint from infrequently-used letters would drop down with the hot lead “z” and not get properly seated in the plate. Such knowledge would be limited to those intimately familiar with typesetting procedures on the old hot lead printing presses. We interviewed a GPO employee who described the process and confirmed the authenticity of printing even though he was surprised at the remarkable content. We found another example of a raised “z” in an official document printed at the same time. The 1954 printing is supported by the extreme consistency with genuine documents printed by the GPO at that time, including title page format, shadowed lettering in title, paragraph spacing, italics on lower case letters, one space after the periods, italicized dated, a document number on each page, and 6 x 9 size. The historically accurate use of capitalization in “First Aid” and two words rather than one for “screw driver” are just a few examples of authentic subtleties in the text. The newly reported finding of a witness who saw the document as he was shredding it; the near-confirmation of the identity of JRT and EWL, the change control officers; the report of the investigator who held it in his hand; and the validation of the existence of the cited buildings at Kirtland AFB are, collectively, very impressive additional attributes of a clearly authentic manual. 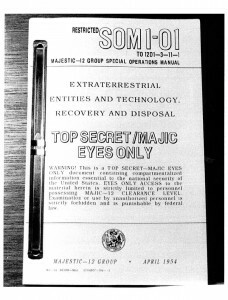 MAJIC EYES ONLY – Earth’s Encounters with Extraterrestrial Technology, p 6-9; and the 2004 UFO Crash Retrieval Conference, available at www.majesticdocuments.com . Air Force Register, Department of the Air Force, 1 January 1955. Joint Statement on SOM1-01 Manual purporting to confirm MJ-12, Skywatch International, March 22, 1999. Comments on the Joint statement on SoM1-01, posted by Skywatch International, date TBD.